"I'm hopeful, partly because we don't know what is going to happen in that dark future and we might as well live according to our principles as long as we're here. Hope, the opposite of fear, lets us do that." "The reckless Bush Administration seems to be generating what US administrations have so long held back: a world in which the old order is shattered and anything is possible." This article first appeared in the Orion Online magazine called "The Magazine of Culture, Creativity, and Change", a publication of the Orion Society. The Orion Society's programs and publications seek to inform, inspire and engage civil society in becoming a significant cultural force for healing nature and community. Rebecca Solnit is a writer, art critic, museum exhibition curator, and political activist. She won wide acclaim and recognition for her 1994 book, Savage Dreams: A Journey into the Landscape Wars of the American West. She is a regular columnist for Orion magazine. Her most recent book is River of Shadows: Eadweard Muybridge and the Technological Wild West. On January 18, 1915, six months into the first world war, the first terrible war in the modern sense -- slaughter by the hundreds of thousands, poison gas, men living and dying in the open graves of trench warfare, tanks, barbed wire, machine guns, airplanes -- Virginia Woolf wrote in her journal, "The future is dark, which is on the whole, the best thing the future can be, I think." Dark, she seems to say, as in inscrutable, not as in terrible. We often mistake the one for the other. People imagine the end of the world is nigh because the future is unimaginable. Who twenty years ago would have pictured a world without the USSR and with the Internet? We talk about "what we hope for" in terms of what we hope will come to pass but we could think of it another way, as why we hope. We hope on principle, we hope tactically and strategically, we hope because the future is dark, we hope because it's a more powerful and more joyful way to live. Despair presumes it knows what will happen next. But who, two decades ago, would have imagined that the Canadian government would give a huge swathe of the north back to its indigenous people, or that the imprisoned Nelson Mandela would become president of a free South Africa? 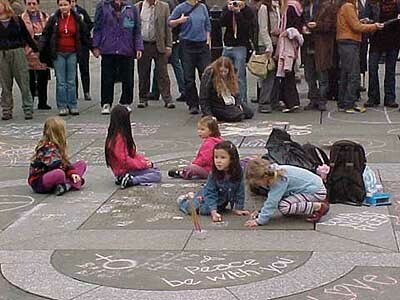 Twenty-one years ago this June, a million people gathered in Central Park to demand a nuclear freeze. They didn't get it. The movement was full of people who believed they'd realize their goal in a few years and then go home. Many went home disappointed or burned out. But in less than a decade, major nuclear arms reductions were negotiated, helped along by European antinuclear movements and the impetus they gave Gorbachev. Since then, the issue has fallen off the map and we have lost much of what was gained. The US never ratified the Comprehensive Test Ban Treaty, and the Bush administration is planning to resume the full-fledged nuclear testing halted in 1991, to resume manufacture, to expand the arsenal, and perhaps even to use it in once-proscribed ways. It's always too soon to go home. And it's always too soon to calculate effect. I once read an anecdote by someone in Women Strike for Peace, the first great antinuclear movement in the United States, the one that did contribute to a major victory: the 1963 end of aboveground nuclear testing with its radioactive fallout that was showing up in mother's milk and baby teeth. She told of how foolish and futile she felt standing in the rain one morning protesting at the Kennedy White House. Years later she heard Dr. Benjamin Spock -- one of the most high-profile activists on the issue then -- say that the turning point for him was seeing a small group of women standing in the rain, protesting at the White House. If they were so passionately committed, he thought, he should give the issue more consideration himself. A lot of activists expect that for every action there is an equal and opposite and punctual reaction, and regard the lack of one as failure. After all, activism is often a reaction: Bush decides to invade Iraq, we create a global peace movement in which 10 to 30 million people march on seven continents on the same weekend. But history is shaped by the groundswells and common dreams that single acts and moments only represent. It's a landscape more complicated than commensurate cause and effect. Politics is a surface in which transformation comes about as much because of pervasive changes in the depths of the collective imagination as because of visible acts, though both are necessary. And though huge causes sometimes have little effect, tiny ones occasionally have huge consequences. Some years ago, scientists attempted to create a long-range weather forecasting program, assuming that the same initial conditions would generate the same weather down the road. It turned out that the minutest variations, even the undetectable things, things they could perhaps not yet even imagine as data, could cause entirely different weather to emerge from almost identical initial conditions. This was famously summed up as the saying about the flap of a butterfly's wings on one continent that can change the weather on another. History is like weather, not like checkers. A game of checkers ends. The weather never does. That's why you can't save anything. Saving is the wrong word. Jesus saves and so do banks: they set things aside from the flux of earthly change. We never did save the whales, though we might've prevented them from becoming extinct. We will have to continue to prevent that as long as they continue not to be extinct. Saving suggests a laying up where neither moth nor dust doth corrupt, and this model of salvation is perhaps why Americans are so good at crisis response and then going home to let another crisis brew. Problems seldom go home. Most nations agree to a ban on hunting endangered species of whale, but their oceans are compromised in other ways. DDT is banned in the US, but exported to the third world, and Monsanto moves on to the next atrocity. The world gets better. It also gets worse. The time it will take you to address this is exactly equal to your lifetime, and if you're lucky you don't know how long that is. The future is dark. Like night. There are probabilities and likelihoods, but there are no guarantees. As Adam Hochschild points out, from the time the English Quakers first took on the issue of slavery, three quarters of a century passed before it was abolished it in Europe and America. Few if any working on the issue at the beginning lived to see its conclusion, when what had once seemed impossible suddenly began to look, in retrospect, inevitable. And as the law of unintended consequences might lead you to expect, the abolition movement also sparked the first widespread women's rights movement, which took about the same amount of time to secure the right to vote for American women, has achieved far more in the subsequent 83 years, and is by no means done. Activism is not a journey to the corner store; it is a plunge into the dark. Writers understand that action is seldom direct. You write your books. You scatter your seeds. Rats might eat them, or they might just rot. In California, some seeds lie dormant for decades because they only germinate after fire. Sharon Salzberg, in her book Faith, recounts how she put together a book of teachings by the Buddhist monk U Pandita and consigned the project to the "minor-good-deed category." Long afterward, she found out that when Burmese democracy movement's leader, Aung San Suu Kyi, was kept isolated under house arrest by that country's dictators, the book and its instructions in meditation "became her main source of spiritual support during those intensely difficult years." Emily Dickinson, Walt Whitman, Walter Benjamin and Arthur Rimbaud, like Henry David Thoreau, achieved their greatest impact long after their deaths, long after weeds had grown over the graves of the bestsellers of their times. Gandhi's Thoreau-influenced nonviolence was as important in the American South as it was in India, and what transpired with Martin Luther King's sophisticated version of it has influenced civil disobedience movements around the world. Decades after their assassinations they are still with us. At the port of Oakland, California, on April 7, several hundred peace activists came out at dawn at dawn to picket the gates of a company shipping arms to Iraq. The longshoreman's union had vowed not to cross our picket. The police arrived in riot gear and, unprovoked and unthreatened, began shooting wooden bullets and beanbags of shot at the activists. Three members of the media, nine longshoremen, and fifty activists were injured. I saw the bloody welts the size of half grapefruits on the backs of some of the young men--they had been shot in the back -- and a swelling the size of an egg on the jaw of a delicate yoga instructor. Told that way, violence won. But the violence inspired the union dock workers to form closer alliances with antiwar activists and underscored the connections between local and global issues. On May 12 we picketed again, with no violence. This time, the longshoremen acted in solidarity with the picketers and -- for the first time in anyone's memory -- the shipping companies cancelled the work shift rather than face the protesters. Told that way, the story continues to unfold, and we have grown stronger. And there's a third way to tell it. The picket stalled a lot of semi trucks. Some of the drivers were annoyed. Some sincerely believed that the war was a humanitarian effort. Some of them -- notably a group of South Asian drivers standing around in the morning sun looking radiant -- thought we were great. After the picket was broken up, one immigrant driver honked in support and pulled over to ask for a peace sign for his rig. I stepped forward to pierce holes into it so he could bungee-cord it to the chrome grille. We talked briefly, shook hands, and he stepped up into the cab. He was turned back at the gates --they weren't accepting deliveries from antiwar truckers. When I saw him next he was sitting on a curb all alone behind police lines, looking cheerful and fearless. Who knows what will ultimately come of the spontaneous courage of this man with a job on the line? We will likely never know, but it seems that the Bush administration decided against the "Shock and Awe" saturation bombing of Baghdad because we made it clear that the cost in world opinion and civil unrest would be too high. We millions may have saved a few thousand or a few hundred thousand lives. We achieved a global movement without leaders. There were many brilliant spokespeople, theorists and organizers, but when your fate rests on your leader, you are only as strong, as incorruptible, and as creative as he -- or, occasionally, she -- is. What could be more democratic than millions of people who, via the grapevine, the Internet, and various groups from churches to unions to direct-action affinity groups, can organize themselves? Of course leaderless actions and movements have been organized for the past couple of decades, but never on such a grand scale. The African writer Laurens Van Der Post once said that no great new leaders were emerging because it was time for us to cease to be followers. Perhaps we have. We succeeded in doing what the anti-Vietnam War movement infamously failed to do: to refuse the dichotomies. We were able to oppose a war on Iraq without endorsing Saddam Hussein. We were able to oppose a war with compassion for the troops who fought it. Most of us did not fall into the traps that our foreign policy so often does and that earlier generations of radicals did: the ones in which our enemy's enemy is our friend, in which the opponent of an evil must be good, in which a nation and its figurehead, a general and his troops, become indistinguishable. We were not against the US and for Iraq; we were against the war, and many of us were against all war, all weapons of mass destruction -- even ours -- and all violence, everywhere. We are not just an antiwar movement. We are a peace movement. Questions the peace and anti-globalization movements have raised are now mainstream, though no mainstream source will say why, or perhaps even knows why. Activists targeted Bechtel, Halliburton, Chevron and Lockheed Martin, among others, as war profiteers with ties to the Bush administration. The actions worked not by shutting the places down in any significant way but by making their operations a public question. Direct action seldom works directly, but now the media scrutinizes those corporations as never before. Representative Henry Waxman publicly questioned Halliburton's ties to terrorist states the other day, and the media is closely questioning the administration's closed-door decision to award Halliburton, the company vice-president Cheney headed until he took office, a $7 billion contract to administer Iraqi oil. These are breakthroughs. American history is dialectical. What is best about it is called forth by what is worst. The abolitionists and the underground railroad, the feminist movement and the civil rights movement, the environmental and human rights movements were all called into being by threats and atrocities. There's plenty of what's worst afoot nowadays. But we need a progressive activism that is not one of reaction but of initiation, one in which people of good will everywhere set the agenda. We need to extend the passion the war brought forth into preventing the next one, and toward addressing all the forms of violence besides bombs. We need a movement that doesn't just respond to the evils of the present but calls forth the possibilities of the future. We need a revolution of hope. And for that we need to understand how change works and how to count our victories. While serving on the board of Citizen Alert, a Nevada nonprofit environmental and antinuclear group, I once wrote a fundraising letter modeled after "It's a Wonderful Life." Frank Capra's movie is a model for radical history, because what the angel Clarence shows the suicidal George Bailey is what the town would look like if he hadn't done his best for his neighbors. This angel of alternate history shows not what happened but what didn't, and that's what's hardest to weigh. Citizen Alert's victories were largely those of what hadn't happened to the air, the water, the land, and the people of Nevada. And the history of what the larger movements have achieved is largely one of careers undestroyed, ideas uncensored, violence and intimidation uncommitted, injustices unperpetrated, rivers unpoisoned and undammed, bombs undropped, radiation unleaked, poisons unsprayed, wildernesses unviolated, countryside undeveloped, resources unextracted, species unexterminated. I was born during the summer the Berlin Wall went up, into a country in which there weren't even words, let alone redress, for many of the practices that kept women and people of color from free and equal citizenship, in which homosexuality was diagnosed as a disease and treated as a crime, in which the ecosystem was hardly even a concept, in which extinction and pollution were issues only a tiny minority heeded, in which "better living through chemistry" didn't yet sound like black humor, in which the US and USSR were on hair-trigger alert for a nuclear Armageddon, in which most of the big questions about the culture had yet to be asked. It was a world with more rainforest, more wild habitat, more ozone layer, and more species; but few were defending those things then. An ecological imagination was born and became part of the common culture only in the past few decades, as did a broader and deeper understanding of human diversity and human rights. Nobody knows the consequences of their actions, and history is full of small acts that changed the world in surprising ways. I was one of thousands of activists at the Nevada Test Site in the late 1980s, an important, forgotten history still unfolding out there where the US and UK have exploded more than a thousand nuclear bombs, with disastrous effects on the environment and human health, (and where the Bush Administration would like to resume testing, thereby sabotaging the unratified Comprehensive Test Ban Treaty). We didn't shut down our test site, but our acts inspired the Kazakh poet Olzhas Suleimenov, on February 27, 1989, to read a manifesto instead of poetry on live Kazakh TV -- a manifesto demanding a shutdown of the Soviet nuclear test site in Semipalatinsk, Kazakhstan, and calling a meeting. Five thousand Kazakhs gathered at the Writer's Union the next day and formed a movement to shut down the site. They named themselves the Nevada-Semipalatinsk Antinuclear Movement. The Soviet Test Site was indeed shut down. Suleimenov was the catalyst, and though we in Nevada were his inspiration, what gave him his platform was his poetry in a country that loved poets. Perhaps Suleimenov wrote all his poems so that one day he could stand up in front of a TV camera and deliver not a poem but a manifesto. And perhaps Arundhati Roy wrote a ravishing novel that catapulted her to stardom so that when she stood up to oppose dams and destruction of the local for the benefit of the transnational, people would notice. Or perhaps these writers opposed the ravaging of the earth so that poetry too -- poetry in the broadest sense -- would survive in the world. American poets became an antiwar movement themselves when Sam Hamill declined an invitation to Laura Bush's "Poetry and the American Voice" symposium shortly after her husband's administration announced their "Shock and Awe" plan, and he circulated his letter of outrage. His e-mail box filled up, he started poetsagainstthewar.org, to which about 11,000 poets have submitted poems to date. Hamill became a major spokesperson against the war and his website has become an organizing tool for the peace movement. But there's an increasing gap between this new movement with its capacity for joy and the old figureheads. Their grumpiness is often the grumpiness of perfectionists who hold that anything less than total victory is failure, a premise that makes it easy to give up at the start or to disparage the victories that are possible. This is earth. It will never be heaven. There will always be cruelty, always be violence, always be destruction. There is tremendous devastation now. In the time it takes you to read this, acres of rainforest will vanish, a species will go extinct, women will be raped, men shot, and far too many children will die of easily preventable causes. We cannot eliminate all devastation for all time, but we can reduce it, outlaw it, undermine its source and foundation: these are victories. Nearly everyone felt, after September 11, 2001, along with grief and fear, a huge upwelling of idealism, of openness, of a readiness to question and to learn, a sense of being connected and a desire to live our lives for something more, even if it wasn't familiar, safe, or easy. Nothing could have been more threatening to the current administration, and they have done everything they can to repress it. But that desire is still out there. It's the force behind a huge new movement we don't even have a name for yet, a movement that's not a left opposed to a right, but perhaps a below against above, little against big, local and decentralized against consolidated. If we could throw out the old definitions, we could recognize where the new alliances lie; and those alliances -- of small farmers, of factory workers, of environmentalists, of the poor, of the indigenous, of the just, of the farseeing -- could be extraordinarily powerful against the forces of corporate profit and institutional violence. Left and right are terms for where the radicals and conservatives sat in the French National Assembly after the French Revolution. We're not in that world anymore, let alone that seating arrangement. We're in one that for all its ruins and poisons and legacies is utterly new. Anti-globalization activists say, "Another world is possible." It is not only possible, it is inevitable; and we need to participate in shaping it. I'm hopeful, partly because we don't know what is going to happen in that dark future and we might as well live according to our principles as long as we're here. Hope, the opposite of fear, lets us do that. Imagine the world as a lifeboat: the corporations and the current administration are smashing holes in it as fast (or faster) than the rest of us can bail or patch the leaks. But it's important to take account of the bailers as well as the smashers and to write epics in the present tense rather than elegies in the past tense. That's part of what floats this boat. And if it sinks, we all sink, so why not bail? Why not row? The reckless Bush Administration seems to be generating what US administrations have so long held back: a world in which the old order is shattered and anything is possible. Zapatista spokesman Subcommandante Marcos adds, "History written by Power taught us that we had lost.... We did not believe what Power taught us. We skipped class when they taught conformity and idiocy. We failed modernity. We are united by the imagination, by creativity, by tomorrow. In the past we not only met defeat but also found a desire for justice and the dream of being better. We left skepticism hanging from the hook of big capital and discovered that we could believe, that it was worth believing, that we should believe -- in ourselves. Health to you, and don't forget that flowers, like hope, are harvested." And they grow in the dark. "I believe," adds Thoreau, "in the forest, and the meadow, and the night in which the corn grows."